For years, many aviators believed that man was not meant to fly faster than the speed of sound, theorizing that transonic drag rise would tear any aircraft apart. All that changed on October 14, 1947, when Yeager flew the X-1 over Rogers Dry Lake in Southern California. The X-1 was lifted to an altitude of 25,000 feet by a B-29 aircraft and then released through the bomb bay, rocketing to 40,000 feet and exceeding 662 miles per hour (the sound barrier at that altitude). 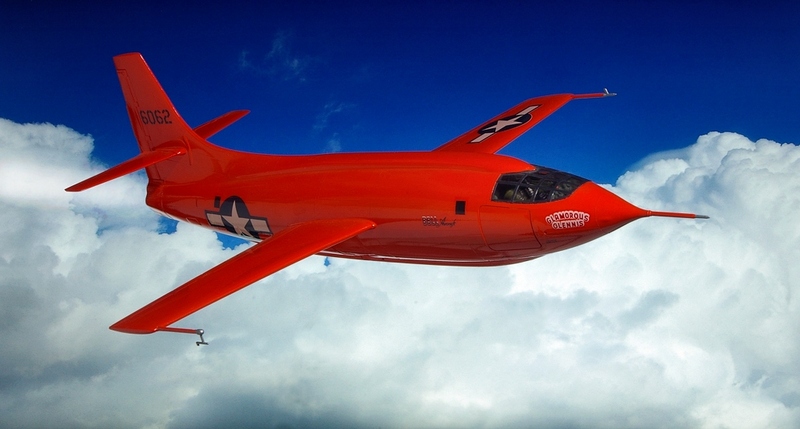 The rocket plane, nicknamed “Glamorous Glennis,” was designed with thin, unswept wings and a streamlined fuselage modeled after a .50-caliber bullet. Because of the secrecy of the project, Bell and Yeager’s achievement was not announced until June 1948. Yeager continued to serve as a test pilot, and in 1953 he flew 1,650 miles per hour in an X-1A rocket plane. He retired from the U.S. Air Force in 1975 with the rank of brigadier general.